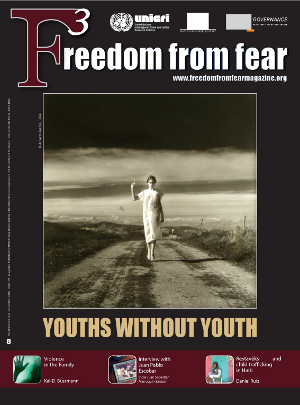 Why is an issue of our Magazine devoted to youth and young people? So far we have presented specific phenomena, from illicit trafficking to cybercrimes. This issue is dedicated to the youths. There are 1.2 billion young people in the world, or 18 per cent of the global population. The UN General Assembly declared 2010-11 as the International Year of Youth. This Year is an important chance to paint a clear picture on the situation that young people face all around the world, an opportunity for governments and civil society as a whole to re-think policies and strategies in favour of youth. An opportunity for youths to make their voices heard. From developing to developed countries it appears that we are betraying the expectation of the young generations and of the generations to come. As governments in many rich countries spend ever larger sums to stabilize economies and to guarantee security, it is not inappropriate to ask how much is really invested in empowering young people. Poorer countries and countries affected by violence see many of their young people leaving their homes to migrate to richer and more stable areas. Not only does this deprive many regions of their most valuable assets, but these young people face many problems in the destination countries. Today young people face record levels of unemployment; they are at the highest risk of both causing crime and being victims of crime; they live in a world increasingly suffering from the effects of man-made climate change. In many ways, today’s young people seem to have a bleak future ahead of them. But it is not all bad news. Great strides in education have been made across the globe over the last 30 years, producing more highly skilled workforces. However, advances in education provision must be continued and need to be followed up with an increase in employment opportunities: the ILO reported that in 2008, 20 per cent of the youth workforce was unable to find employment. As access to, and use of, new technology increases, we see new ways developing for young people to get involved in their communities, both local and global. Programmes to prevent crime amongst young people should focus on both supporting the victims of crime and rehabilitating offenders – reconciliation between both sides of any conflict is crucial for a peaceful future. Many young people are feeling disconnected from their own communities and oppressed by the political processes that govern them. But young people do have the strength and the capabilities to change their realities. They do care about what is going on in the world, and they are prepared to take action to make their concerns known. The 1.2 billion young people on the planet are a great resource for countries everywhere. They will have some great ideas for solving some of the world’s biggest problems and must be listened to and engaged with. Above all everyone in society must be made to understand the responsibilities that young people have in the world they will shortly be called upon to manage, and must make sure that they are well prepared for the task. This issue includes contributions from many young people; their articles and visual work should inspire us all. The issue is dedicated to Giuseppe Di Matteo a 12 year old boy, kidnapped by the Italian Mafia and kept as a hostage for 26 months in retaliation for his father turning state’s evidence. Giuseppe was strangled and his body disposed of in acid. We dedicate this issue to all children and young people whose rights are violated every day and we devote it to the real dreamers of our society. Only young people can make our dreams become reality.